Organic farmers Joanna and Eric Reuter say their Missouri farm was contaminated with unwanted pesticides last year. Their neighbors grow acres of corn and soybeans and they mostly got along. That is until one July evening in 2014. Joanna Reuter was transplanting some broccoli when a sound caught her attention. They spotted a crop duster passing unusually close to their property. Shortly after experiencing headaches and irritation, they knew the wind had blown something chemical onto their land. Without knowing what it was, they were left in the lurch with a big asterisk on the authenticity of their organic crops. Organic farmers Joanna and Eric Reuter point to wear they saw a crop duster dropping pesticides unusually close to their Missouri farm in 2014. And for the guilty crop duster? He received a warning letter. The farm next-door did not respond to my requests for an interview. In the U.S., farmers use nearly 900 million pounds of pesticides every year to protect their crops from weeds and insects. But sometimes those chemicals drift to neighboring property, which can ruin crops on organic farms. Kaci Buhl of the National Pesticide Information Center says there’s no clear picture of how common pesticide drift is for the nearly 20,000 organic farms nationwide. “The data would get better and possible resource allocation would increase if there was more consistent reporting,” she said. Each state’s agency responsible for handling pesticide drift investigations – typically the state Agriculture Department or the equivalent – deals with investigations differently. Missouri Department of Agriculture spokesperson Sarah Alsegar says the department does its best but is sometimes limited by the turnaround time of lab analysis as well as gathering records from the pesticide applicators in the region. That’s why the organic industry is pushing for national regulations that prioritize drift investigations and consider stricter penalties for negligent farms. Farmers say investigations into chemical drift can drag on for months and penalties vary. “Once we do have a federal approach to pesticide drift I suspect we’ll be a lot more coordinated in our responses and potentially have better prevention strategies and more timely reaction to events when they do occur,” said Nate Lewis with the Organic Trade Association. Organic farmer Margot McMillen holds a grape lead damaged by pesticide drift in Missouri. Lewis says that drift needs to remain on the forefront of policy efforts especially as organic acreage grows and farmers become more aware of pesticide drift. Currently, there is no federal policy outlining pesticide drift investigations or recourse. Recently, organic farmer Margot McMillen was traipsing through her muddy farmland about 25 miles from Chert Hollow. 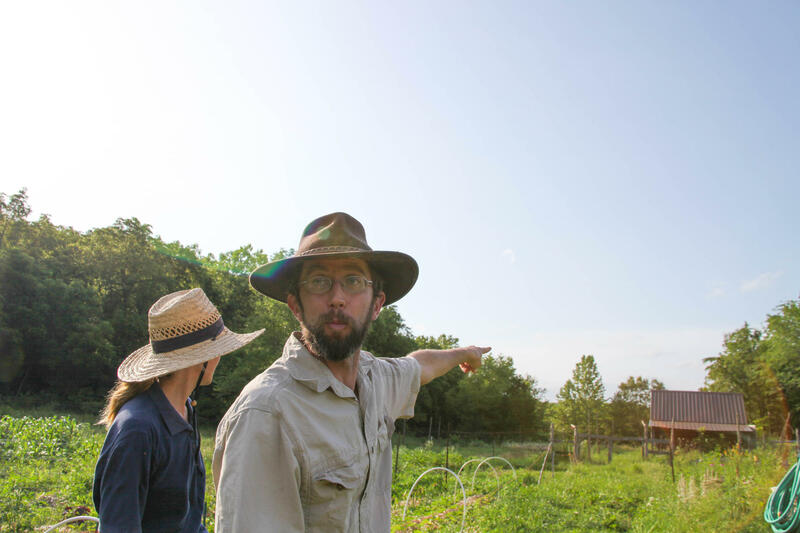 At her farm, called Terra Bella Farm in central Missouri she grows all sorts of vegetables. While scanning her crops after a recent rain, she noticed some possible pesticide damage on her grape vines. McMillen is all too familiar with curled up foliage. In 2014, pesticide drift took a $25,000 chunk out of her tomatoes. This year, she says, she’s been forced to grow her plants “defensively.” Large bushes now block the wind from the road. She moved crops over a hill crest away from other farms and moved the tomatoes inside the greenhouse. McMillen says a stricter penalty system could help improve accountability for pesticide negligence. Ultimately, she says she and other organic farmers need to plant defensively to survive. 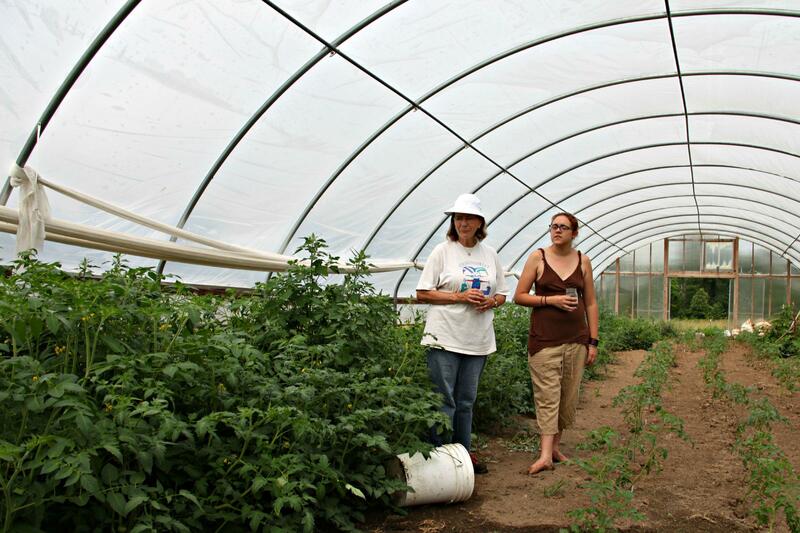 Organic farmers Margot McMillen and Julie Wheeler check on their tomato plants they have moved into the greenhouse as protection from pesticide drift in Missouri.